Lets just say, you run a nice little orange shop called, “Joe’s Awesome Oranges“. And being an Excel buff, you record the daily sales in to a workbook, in this format. After recording the sales for a couple of months, you got a refreshing idea, why not analyze the sales between any given 2 dates? for analysis sake. How would you sum up the sales between the dates in F5 & F6? This is where use the powerful SUMIFS formula. to calculate the sum of sales between the dates in F5 & F6. $C$5:$C$95 portion: This is the range of cells where our Sales values are recorded. We want these to be summed up based on the conditions as below. 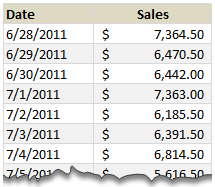 When combined, the SUMIFS formula checks for both conditions and adds sales only for dates between Starting (F5) and Ending (F6) dates. Learn more about SUMIFS syntax & how to use it. What formula you should use in Excel 2003? As you may know, SUMIFS formula does not work in earlier versions of Excel. But you don’t have to shut your orange shop because of that. We can use the all powerful SUMPRODUCT formula for this. For example, =SUMPRODUCT(($B$5:$B$95>=$F$5)*($B$5:$B$95<=$F$6),$C$5:$C$95) would work the same. Learn more about SUMPRODUCT formula & why it is awesome. We can also use SUM & OFFSET combination to perform this calculation, provided dates are in smallest first order and all dates are entered. For the example, see download file. Click here to download example workbook & play with it. How would you sum up values between 2 dates? In reporting situations, showing summary of values between 2 dates is a common requirement. So I use either formulas like above or Pivot Tables to do this. What about you? How would you sum up values between 2 dates? Please share your ideas & tips using comments. How to find if 2 sets of dates overlap? If you want to learn SUMIFS, SUMPRODUCT, OFFSET and 40 other day to day formulas, then consider my Excel Formula Crash Course. It has 31 lessons split in to 6 modules and makes you awesome in Excel formulas. Click here to learn more about this. I would apply a filter and use function subtotal, with option 9. This way you can see multiple views based on the filter. hey Chandoo, the solutions you proposed are very efficient, but if I wanted to be fancy I would do it this way .. the references are as your example workbook. and have D1 be the date that I want to sum to. In Excel 2003 (and earlier) I'd use an array formula to calculate either with nested if statements (as shown here) or with AND. I turned the data set into a table named Dailies. I named the two limits StartDate and EndDate. Works as simple as it is. Great examples and thanks to Chandoo. You have simplified my work. which is most efficient and fast, if all are efficient ? Thank you for this formula, I've just spent ages trying to find something to work on my data, I knew it would be possible! Don't care if others think there are easier/other ways to do it, you explained it so I understood it and could apply it to what I was doing so I'm happy! I have a list of people's names in column A, I have a list of dates in column B which records the dates they have been off sick, in column C I have either 1 if it is a full sick day or 0.5 if it is a half day. What I would like to do is to add up the number of dates a specific person has been off within two dates. For example, I want to look at my list of names and to find Joe Bloggs (column A), then add up all his sick days (column C). The start date will be in cell E1 and the end date will be in F1. If this possible using SUMIFS? Yes, with the help of SUMIFS you can have the solution. Note: you need have an extra col. D2 where you will input Name of the person. Please attach a file so that a specific answer can be delivered. Thanks for this - it solved the problem that I was having. However can someone please explain to me why the "" needs to be around >= and <= as well as why we need to add & in order for the formula to work? Thanks in advance! ikkeman had posted the same thing.